It has been several months since I have looked at any cooling solutions offered by Corsair and since my last visit with their cooling solutions they have come out with three new Low Cost Liquid Cooling (LCLC) systems. 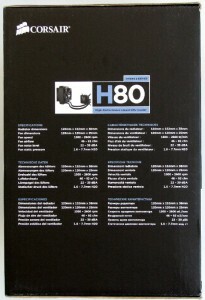 The Hydro Series H60, Hydro Series H80 and Hydro Series H100 LCLC systems. Today we will be looking at the Hydro Series H80, which is their newest offering that fits in place of a single 120 mm case fan on either the top or the back of the case. I assume this is the successor to the Hydro Series H70, which I reviewed back in October of last year. 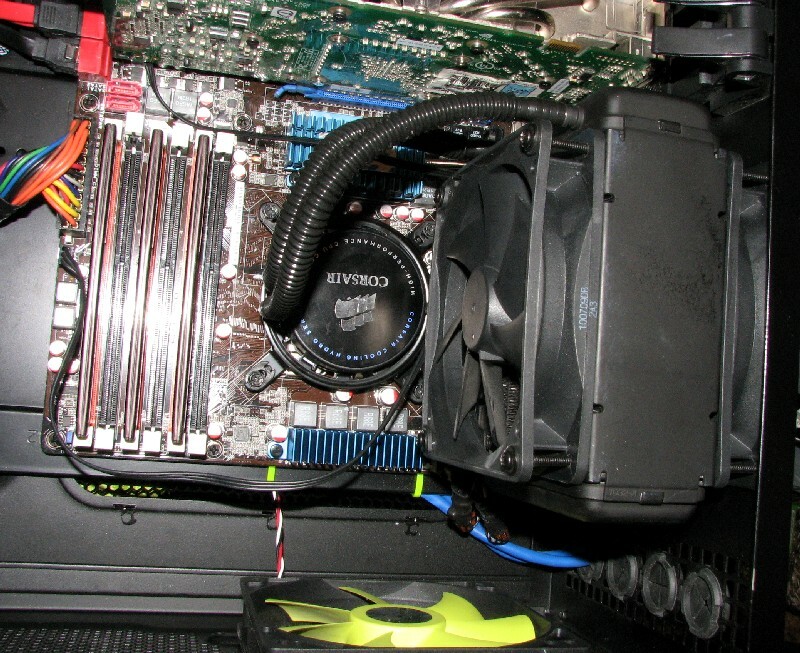 I found the H70 to be an effective, if somewhat expensive cooling solution back then. We will see if the new H80 brings better performance and pricing to the table. 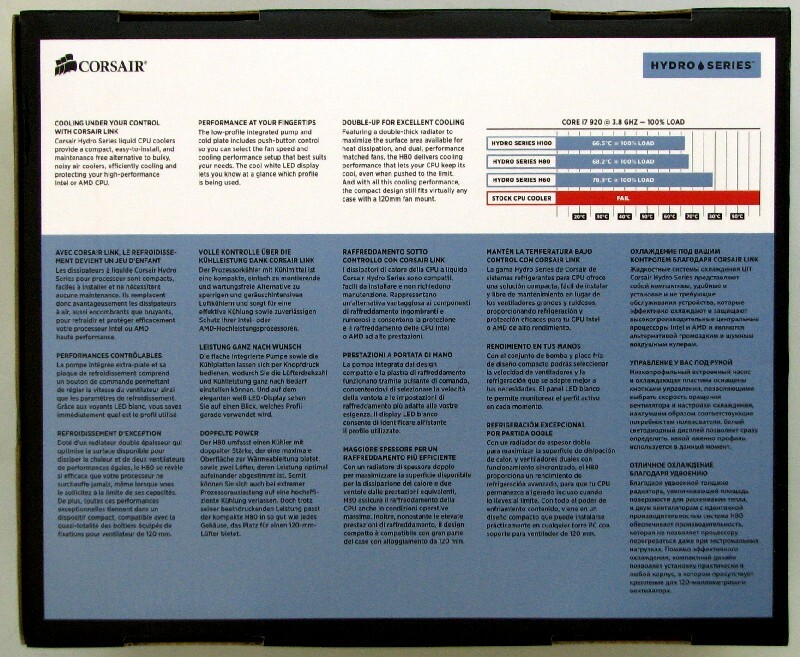 Corsair was originally founded as Corsair Microsystems in 1994 and originally developed Level 2 cache modules for OEMs. Once Intel started integrating L2 cache into their processors, Corsair migrated to making DRAM modules, primarily for server systems. 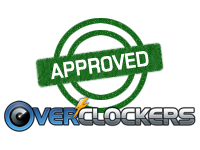 In 2002, they started marketing DRAM modules aimed at the enthusiast and overclocking crowd. Since then, Corsair has diversified into marketing high quality power supplies, cases, CPU cooling solutions, flash drives, SSD drives and audio equipment. Their products are now available to end users in over 60 countries through their marketing and distribution channel arrangements. 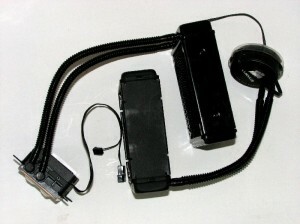 The H80 includes a double-thick radiator and two 120 mm fans. It can be installed almost anywhere you can install a standard 120 mm PC case fan, and includes mounting brackets for all modern CPU sockets. You no longer need to invest into finicky modular water cooling systems to get serious CPU cooling performance. 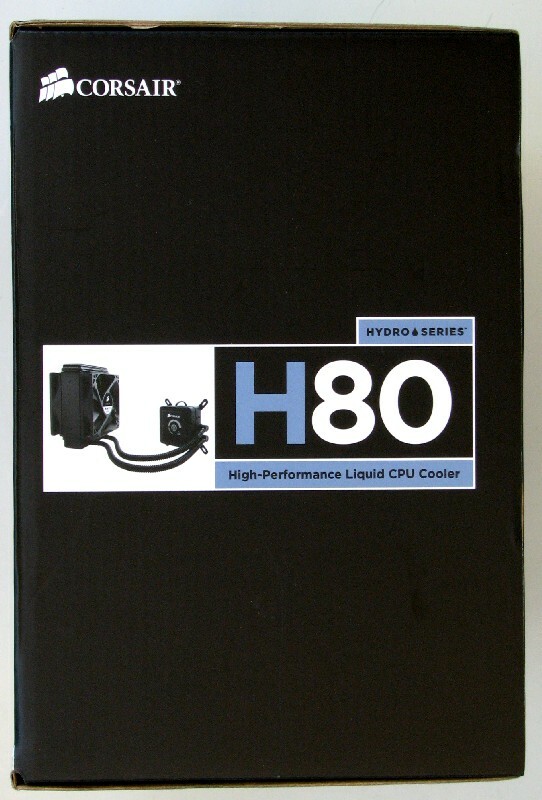 Each Hydro Series Liquid CPU Cooler is a sealed, closed-loop system that comes pre-filled and never needs refilling. Tubing is constructed from low-evaporation FEP for a long lifespan. Even the thermal compound is pre-applied. You’ll be up and running in minutes. 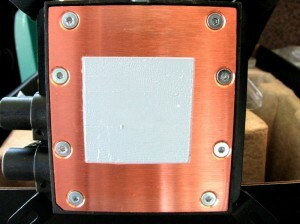 Both the H80 and the H100 include a low-profile, light-weight cooling unit with a micro-channel copper cold plate and a split-flow manifold. The result of all this attention to fluid dynamics is CPU cooling that’s remarkably efficient, with a total noise level that’s lower than most stock CPU fans. 1. Who is the OEM of the H80? Answer: CoolIT makes the H60/H80/H100 for us to our specs. 2. Who is the OEM of their pre-applied thermal interface material? Answer: It’s a high performance compound we cannot currently disclose. Apologies here, but we have an NDA in place. 3. Will you start retailing your thermal interface material? 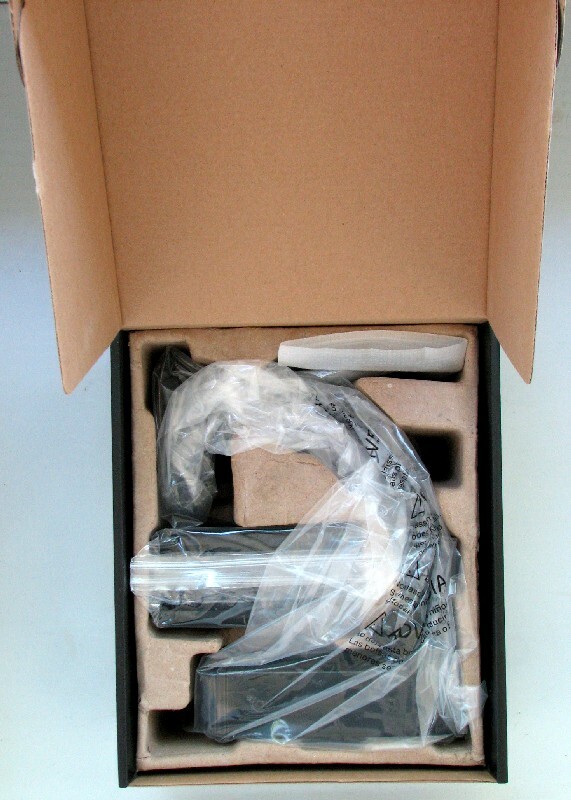 As delivered, you get exactly one mount and then the customer is on his own as far as thermal interface material is concerned. Answer: We currently do not have any information on whether we will or will not retail this compound. 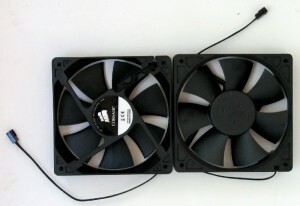 4. Who is the OEM of the included fans? Answer: We do source fans from different manufacturers. 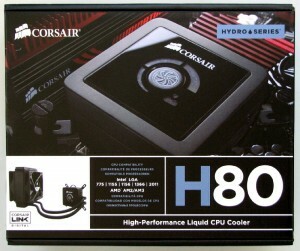 They are custom designed for the H80/H100 and manufactured to CoolIT and Corsair specs. 5. What is the wattage of the fans that come with the H80? 6. Is the system filled with the same fluid as your earlier H70 and H50 systems? 7. Are the fans also covered under the standard 5 year warranty? 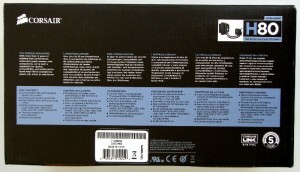 Answer: The Warranty covers the complete unit including fans. One other item to note with the new series of LCLC systems built for Corsair by CoolIt is that Corsair also lengthened their warranty from the 2 years they gave to the H50 and H70 all the way to 5 years for the CoolIt built units like this one. Corsair must have some pretty good faith in the build quality of these units and included fans. Like the previous offerings I have looked at from Corsair, their packaging is both very robust and good looking, with lots of marketing information on the outside. The box the H80 is packaged in measures 10 7/8 X 9 1/16 X 6 1/8 inches (275 X 237 X 155 mm). 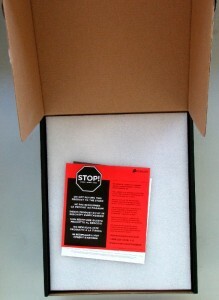 Upon opening, you find all the components securely packed and protected against shipping damage. The box itself has plenty of pictures and marketing points on all sides, but isn’t done garishly. 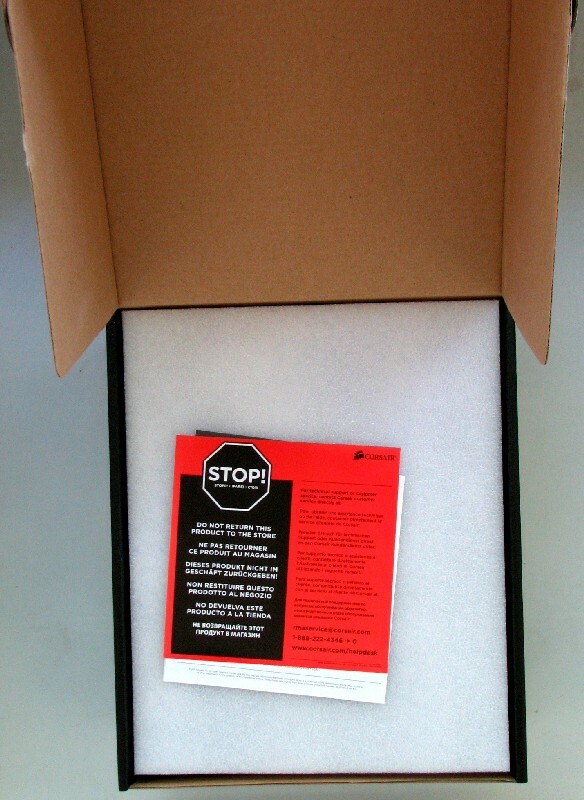 It looks pretty much like the H70 and H50 boxes as a matter of fact. 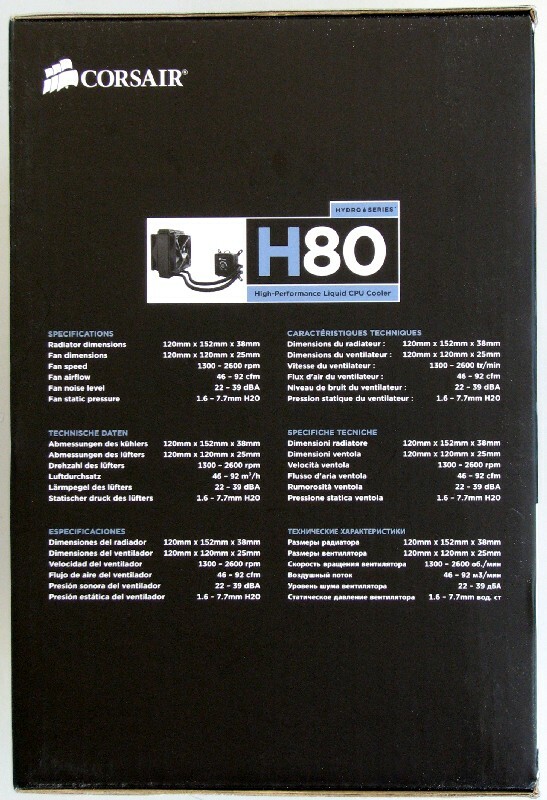 All the marketing points are printed up in several languages on the box, just like their earlier Hydro Series offerings. Upon removing the cooler and mounting hardware from the packaging, we see a fairly thick radiator which is not quite as thick as the H70 and the pump/coldplate assembly is totally unlike the older H70 or H50 assemblies. This stands to reason, since Corsair also switched OEMs for the new lines. 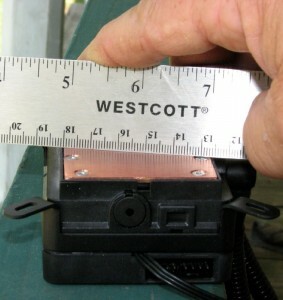 The pump/coldplate mounting hardware is totally different and, in my opinion, it is much nicer as far as mounting goes. 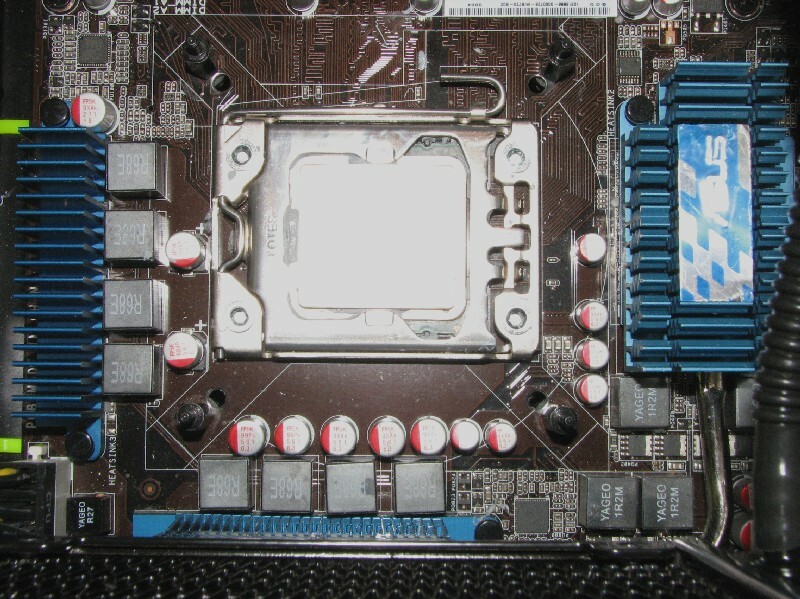 Instead of mounting a capture ring to the Intel mounting holes around the socket, you have a simple “X” style back plate that installs on the back side of the motherboard with four double male ended standoffs. On the pump coldplate assembly, there are four arms with slots that the mounting standoffs go through and the mounting nuts simply screw down on them. No springs are used to set the mounting tension, but rather the mounting pressure is set by screwing the four mounting screws in until they stop. For AMD systems, it is even a bigger change from the H70 or H50. 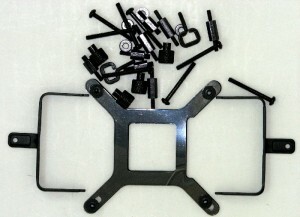 The H80 uses the stock AMD retention module instead of using a back plate. 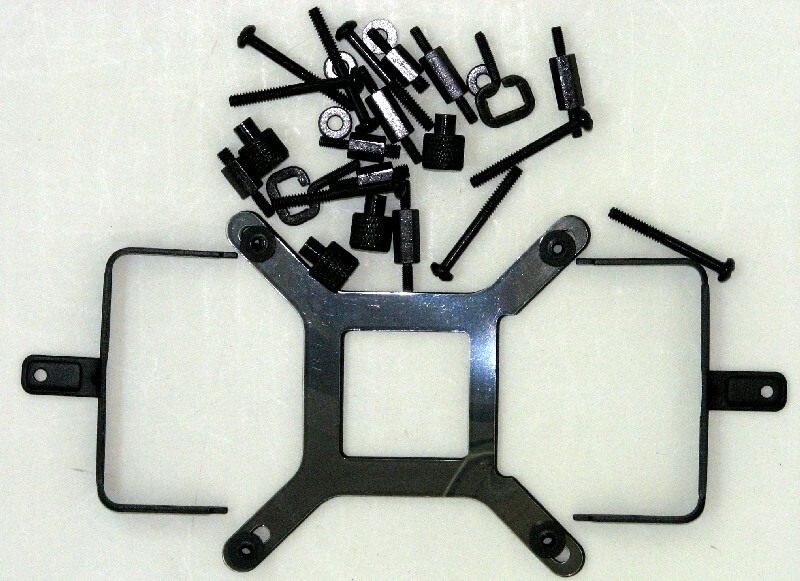 You have to remove the Intel mounting arms from the pump/coldplate assembly (held with 4 screws) and install the AMD mounting arms, which have a single arm on each side that comes out in the middle of the side. Then you install a couple of “O” type hooks that have a threaded stud on one end to the mounting arms that are screwed into the pump/coldplate assembly and they hook onto the center latches of the AMD retention module. Then it is just a matter of tightening the screws down until proper mounting tension is achieved. 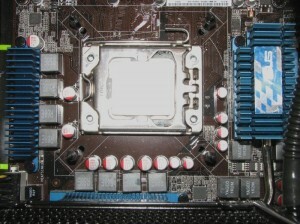 For AMD, the screws don’t have a shoulder to tighten to, so don’t just keep tightening them down until something breaks. 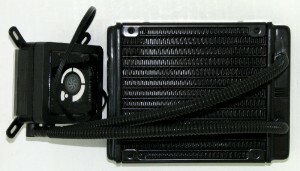 The radiator itself measures 153 X 119 X 42 mm at the area the fans attach and has a maximum depth of 45 mm at the radiator tank seams. There is only about a 3 mm plenum built into each side of the radiator assembly, which is a bit less than the H70 radiator. The radiator has a fin density of around 15 fins per inch, which also is a bit less than the fin density used on the H70. A welcome change from the H70 is that the hoses connecting the pump/coldplate to the radiator are now around 60 mm longer at 280 mm between the barbs, which should make for a bit easier hookup on cases with longer spacing between the socket area and the exhaust fan hole. The pump/coldplate assembly measures 66 X 66 X 41 mm and the rad/pump assembly has a measured mass of 750.2 grams. 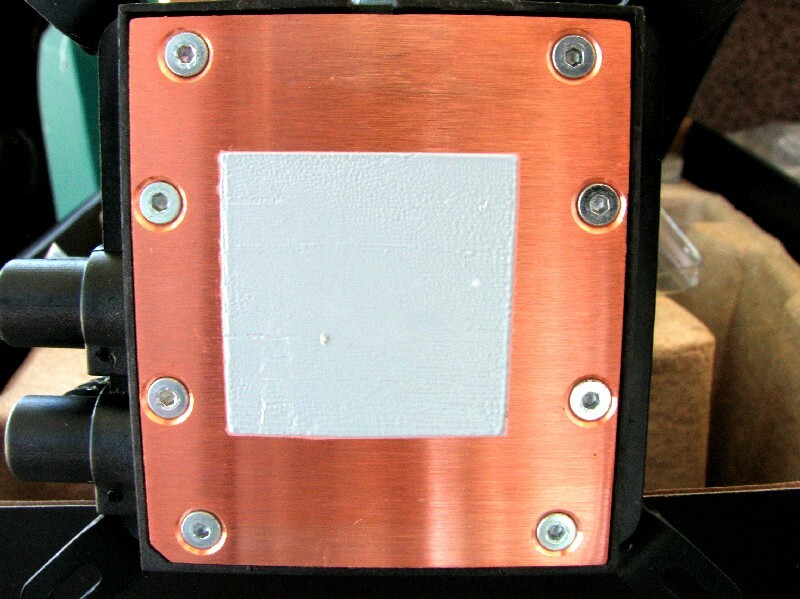 There are many premium heatsink designs out there that have a higher mass than this assembly. The fans themselves have a measured mass of around 160 grams, putting the completely assembled mass of the H80 at 1070 grams, which isn’t any heavier than many tier 1 heatsinks. The instruction sheet included with the H80 is pretty simplistic. It gives a pictorial breakdown of the steps needed to mount on either Intel or AMD systems with no written instructions. There wasn’t really a need for written instructions for mounting, since the pictorial breakdowns show the steps needed to mount this cooler pretty clearly. One thing that I don’t like about the included instruction sheet is the total lack of anything describing the operation of letting their pump/coldplate assembly control the two included radiator fans. It would make it much clearer to the buyer of this product just what the capabilities of their control module built into the pump/coldplate unit can do as far as controlling fan speeds at the three settings. Since the radiator/fan assembly is already pretty bulky, I stayed away from testing this unit with 38 mm thick fans or my 76 mm thick Sanyo Denki compound fan. I did test the H80 with the fans set up in a push pull arrangement, since that is the way this cooler was designed by Corsair to operate most efficiently with. Since I still have the H70 test unit I received last year, I also decided to test the H80 with the fans included with the H70 and vice versa. I did this to see if any efficiency gain comes from different fans or if the H80 unit as a whole is more efficient than the earlier H70. 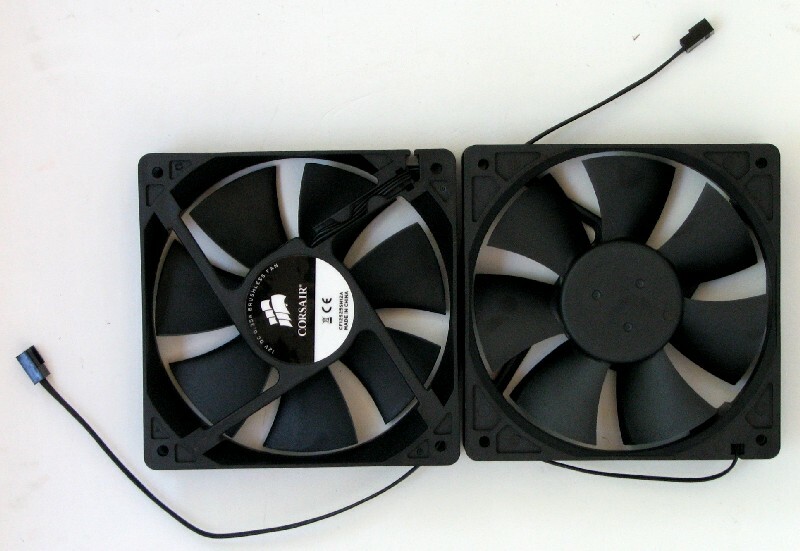 I ended up testing this H80 cooling system with the following fan choices. All testing was done with the fans plugged into the motherboard headers instead of the pump/coldplate unit. This was done for fan speed monitoring plus it is the way I normally test with (except for extremely high draw fans that pull power from a 4 pin molex). And this also had to be done as I will explain below. As for installing the H80 in my testbed system, I ended up ignoring Corsair’s directions to have the fans installed as intake fans into the radiator from the back side of the case. I did this for a few reasons. First and foremost, it goes against the airflow design the case was originally meant to have and could potentially make other components run hotter than they should. Plus, since the Dragon Rider case has large sized mesh covering the side door and it has a 220 mm fan blowing cool air in, I didn’t think it would make much difference in performance anyways. Second, I did try one mount with the fans blowing inward and found that the fan noise was much magnified and a lot more annoying in that configuration. Also, the average temperature difference was less that 1 °C (in favor of Corsair’s recommendation) between the fans exhausting and being intake fans, so I tested in the quieter configuration. 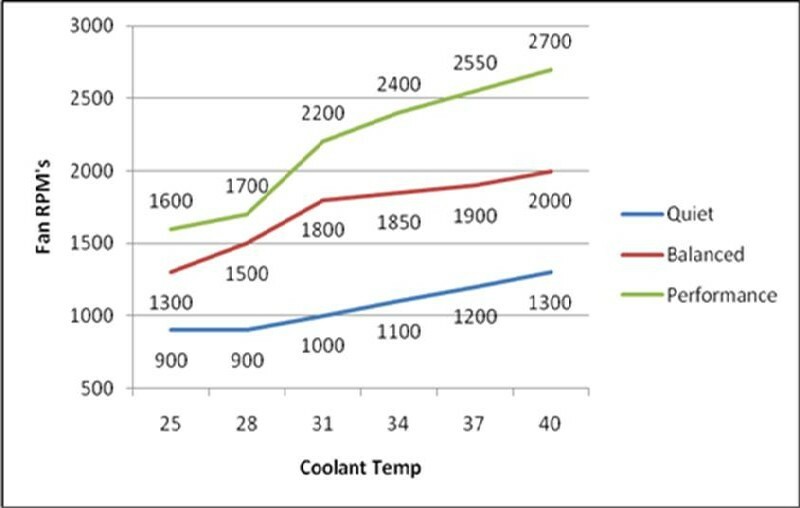 What I am seeing in this chart is some excellent performance from this cooling solution and it also shows decent scaling with increasing CFM and static pressure. 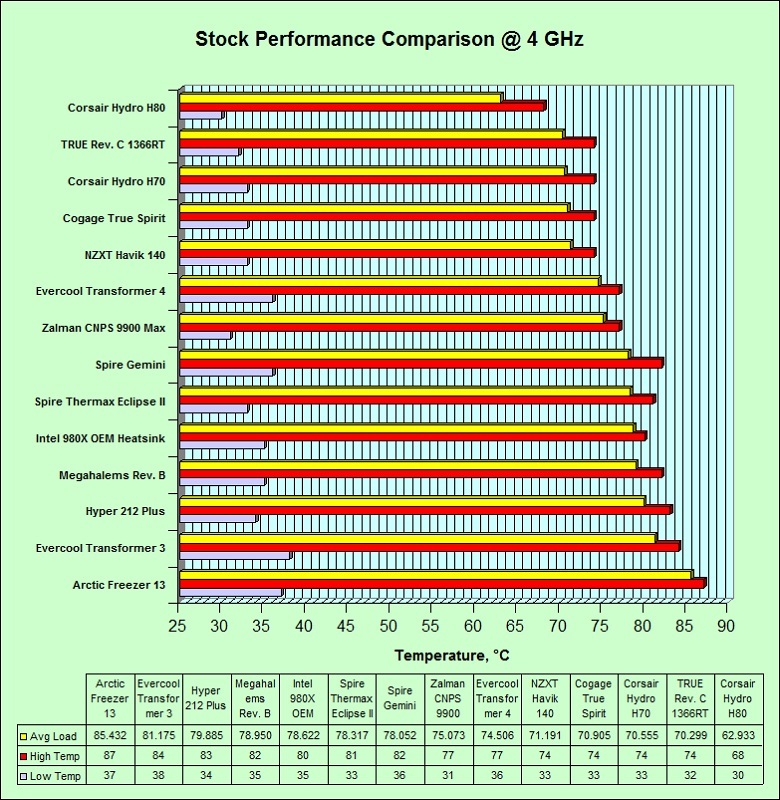 It also highlights how high performance the stock fans really are, in that you see a definite drop off in cooling when testing with the H70 fans, the Gentle Typhoon AP-15 fans and even the Scythe SFF21G fans. It’s only when you get to the Delta fans and the server class Gentle Typhoon AP-31 fans that you see a noticeable increase in performance, but this performance does come at a price. At full speed, the stock H80 fans are on the loud side and I found the Delta fans to actually be no more annoying in tone and perceived loudness when set up with the fans exhausting air from the case. There was quite a bit of airflow noise but motor noise was minimal. Again, the AP-31 fans gave best performance, but unless you are partially deaf, I can’t see a person living with them installed on a normal basis. The H80 doesn’t need them anyways as even with the quiet AP-15 fans performance was extremely good and beats the TRUE Rev. C stock performance by 2 °C. 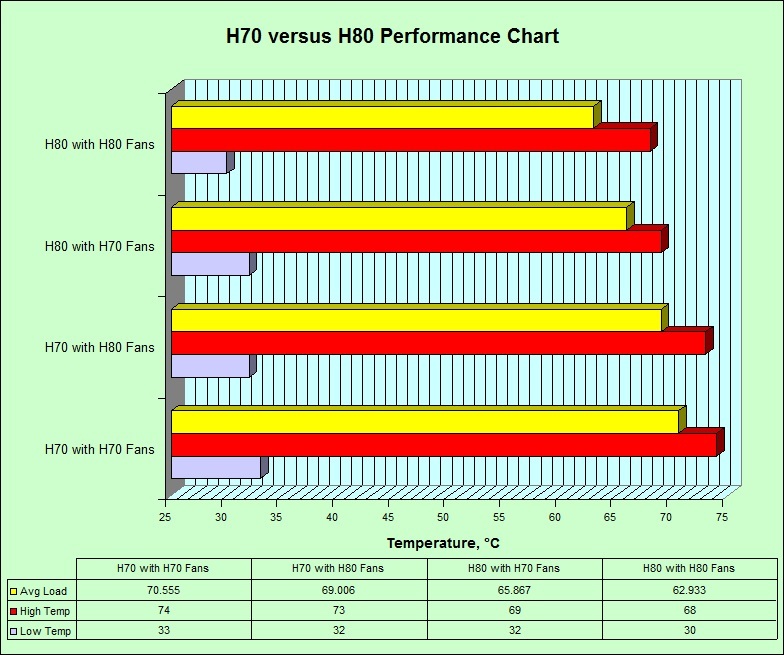 As you can see from the above chart, Corsair dramatically improved the performance of the H80 as compared to the H70. Even with the H80 using the H70’s fans, it still eclipses its older brother’s performance when the H70 is mounted with the higher performance H80 fans. That is simply an outstanding result, as the H70 was no performance slouch itself. As you can see here, the H80 simply decimates all other stock configurations. It’s much nosier than the others at full speed, but even at lower speeds its performance is simply outstanding. I am very impressed with this performance to say the least. Before going on to my conclusion, I have to also talk about Corsair’s onboard “Intelligent” fan controller that is integrated into the pump/coldplate. In the center of the pump/coldplate top, there is a push button that is wrapped around by three different lights and however many lights are lit lets you know which mode the fan control is in. At first I thought it was a dumb controller that simply gave three different voltages; a low speed voltage, medium speed voltage and full speed voltage. However, when I started measuring the voltages I got some really anomalous readings, especially in the performance mode where the voltage wasn’t nearly full rated voltage. 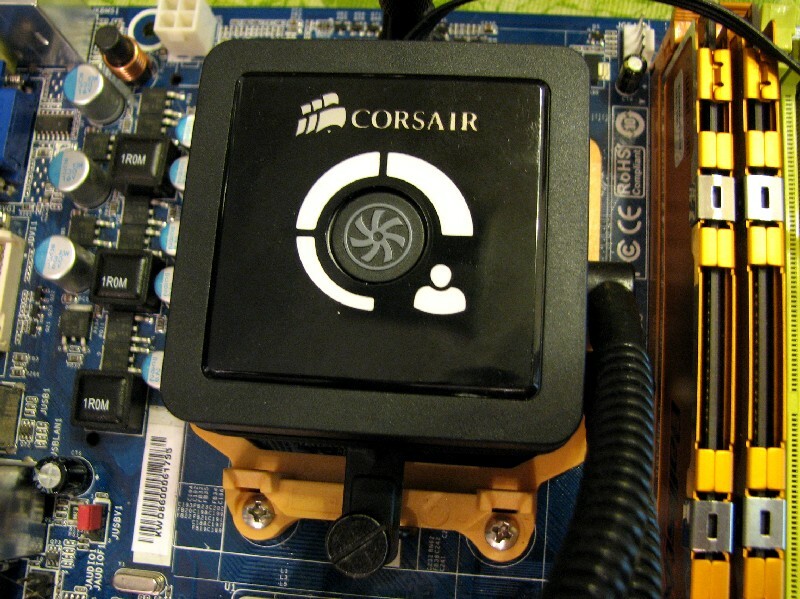 After conversing with Corsair, they informed me that the controller built into the pump/coldplate unit also monitors temps in the fluid loop and varies fan speed according to fluid temps. Since they are also marketing the Corsair Link Commander as a separate add-on, it stands to reason that they have some kind of microprocessor control for it to interface with. You don’t need to have a Link Commander added to the cooling system for variable fan speed control because they have a default profile built into the unit for each different fan profile. There are three different profiles programmed into the the unit; a “quiet” profile, a “balanced” profile, and a “high performance” profile. 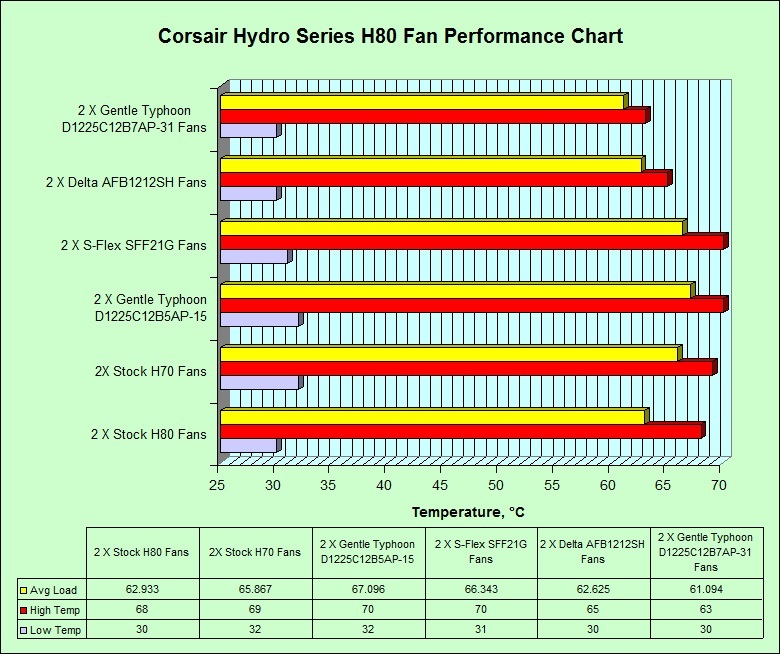 All three profiles give a minimum and maximum voltage (and fan speed) that varies with fluid temps, and Corsair kindly allowed me to use their default fan profile chart in this review. Quiet Profile: Minimum voltage was 6.48 v. Maximum voltage was 7.54 v.
Balanced Profile: Minimum voltage was 7.60 v. Maximum voltage was 9.56 v.
Performance Profile: Minimum voltage was 8.47 v. Maximum voltage was 11.69 v.
One other item I want to cover about the fan controller built into the pump/coldplate is how much load it is rated for. Since this isn’t listed on their website anywhere that I could find, I asked Corsair about it. 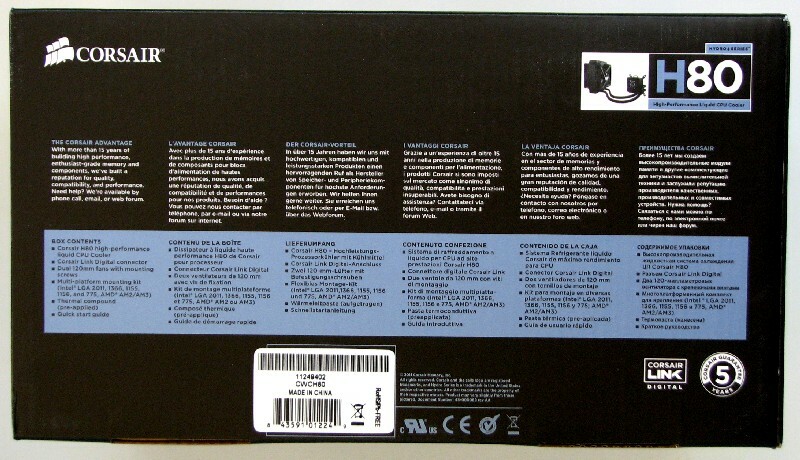 They replied that the controller is rated for a maximum of .5 amps per header, or 6 watts per header. That gives the H80 a load total of 12 watts, since it has 2 headers but with the H100, it will support a total load of 24 watts since it has 4 headers on it. Also, these fan headers on the pump/coldplate are 4 pin PWM compatible, and the controller will support the use of PWM fans on it. Looking around with a quick search, the cheapest I found this cooling solution listed for sale is around $88.00 from some company I’ve never heard of before. You can find the H80 for sale for less than $95 shipped from several online vendors that I do trust, such as Newegg, Mwave, Directron and Buy.com. That price is not all that much more than what you will pay for other top tier air coolers such as the Noctua NH-D14 or the Thermalright Silver Arrow. 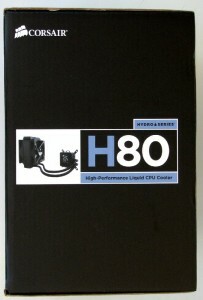 This makes the Hydro Series H80 a solid competitor to them in both price and performance. Based on this and the overall performance of this cooling solution, I have to rate this as an Overclockers Approved cooling solution. 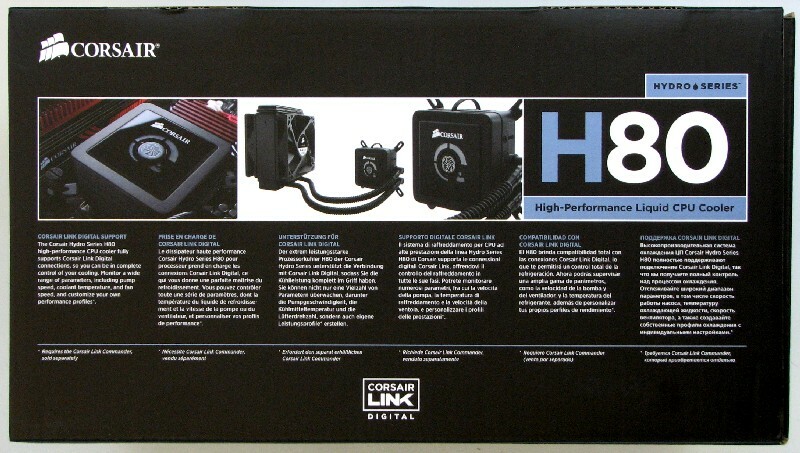 If you are looking for a top end cooler, the H80 simply should be on your short list to look at. In closing, I would again like to thank Corsair for providing us this LCLC system for testing. You guys have really stepped up your design and execution of these LCLC systems with your second generation of units and have something here that not only improved an already good performing first generation design, but has also set a new performance bar for other LCLC systems and tier one air coolers to strive to reach. The only thing I really think you should do to improve the user experience is to add a small tube of your TIM to the packaging, so your customers can have more than one install before having to get some other thermal interface material. I will be back soon with another review. I have a few heatsinks waiting for review, so I should be coming out with several reviews over the next few months, so stay tuned. Excellent review and comparison Jim, I really like the way you keep the references the same so you can see how cooling compares using the same CPU platform with different cooling solutions. I trust you will be getting a H100 soon and it will be interesting to see how it compares to the single rad Corsair coolers. Thanks Edmund. That is one reason why I am trying to retest some of my earlier heatsink reviews on my present platform, so the figures are pretty much directly comparable. And I hope that Corsair decides to send me an H100 for testing too. I am really curious to see how it compares to the H80 in performance. From what I gather, the radiator on the H100 is quite a bit thinner than the H80 rad. And I am hoping that I will be able to test it with a push pull setup too, since it uses the same fans as the H80 (and can borrow the H80 fans for push pull testing. I just hope the Dragon Rider has enough headroom above the board to do a push pull setup or otherwise I will have to try installing the pull fans externally on top and rigging a gasket between the H100 rad and the case top material to seal it. How loud is it? From the specs is seems like it is louder than an H70 and my H70 is irritatingly loud. Thanks MUD, good review as always. Looks like I can say they finally did it right. Heck, I could drop 1/2 of my rig and be happy. 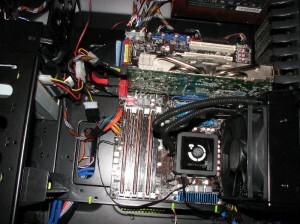 But the OC itch is growing..... Naa, I like my pretty overcooled rig.... Overcooled.com... Hmm IMOG, you listening? I have really enjoyed watching these Corsair coolers evolve to a viable option. For sub $100.00 that looks like a great option versus some of the air coolers on the market. Nice review. SupaMonkey, I really don't do any testing for quietness since I have 5 real computers (plus a Mac Mini ;) ) in my computer room and a window AC to boot; it's got a fairly high noise background to start with. But, when checking the fans with the onboard controller and seeing where the intelligent controller started throttling the fans, the sound from the fans at full blast are much noisier than the fans for the H70. And I expected that, since they also turn up 700 rpm higher than the H70 fans, but I also found the fans to be fairly quiet when on the low and balanced settings on the pump controller. I would say that on the balanced pump setting, the fan gets around as the H70 fans when it is running full blast, but ramps down quite a bit if it's not under high load conditions. The biggest differences I see with this unit as compared to the H70 is that they improved pump/coldplate efficiency by a fair margin, plus they have integrated a decent and intelligent control module into the pump for controlling fan speeds. The disadvantage to this is that you can't monitor fan speeds at all unless you drop another hundred or so on their Link Commander monitor deal. :( I do hope they send me one of those too for testing. I know that it's supposed to be able to use programmable fan profiles and other things, but it's mighty expensive. Is it possible to install one of Corsair's Hydro Series coolers on a graphics card? 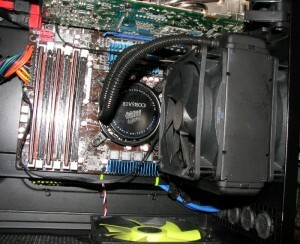 I'm considering using the H-100 to cool the Intel CPU and possibly the H-80 to cool an ASUS GTX 570. I'm still in the planning phase of the project and any insight would be greatly appreciated. Maybe, but it's probably a bad idea IMO...the heatload oyu're looking at for a 570 vs a stock-clocked CPU is pretty large if memory serves me right on the 570's specs. I have read of a few people doing it. They had to do some creative mods for mounting it I believe. And Mort, I feel that the H80 would probably do a decent (not great) job if you left the fans on high and were able to get a good, solid mount. But running the fans on the rad at full speed would kind of negate the reason to use water on the gpu, IMO at least. In summary, BIG fans, probably louder then the stock 570 fans (depending on which one) to accomplish that goal.